The concept of “being green” has evolved over the years. The Food Bank takes pride in our use of solar energy and the fact we recycle papers, glass and plastics, and have an organics bin. As you might imagine, we also have a special interest in preventing food waste. When we divert food from going into the landfill, our hungry neighbors and our environment all benefit. Add drained juice from canned tomatoes to your water or broth when making flavored rice or quinoa. Plant discarded white bottom part of green onions in soil to regrow. This works for some other vegetables too. Save the juice from canned garbanzo beans to use as a substitution for egg whites. Do a search on “acquafaba recipes” to learn about all of its other uses! 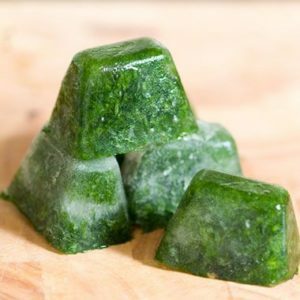 Chop surplus herbs at their peak and place into ice-cube trays. Add water and freeze. Defrost “cubes” as needed to flavor food. Make croutons out of stale bread. Freeze unneeded fruits and vegetables BEFORE they spoil (remove unedible parts beforehand). Use bruised/overripe fruits in blended smoothies. Add used coffee grounds and eggshells to amend soil in vegetable gardens. Use vegetable scraps to make broth (store scraps in freezer until you have enough). If you use vinegar/water as a cleaning agent, add fresh citrus peels (lemon, orange, lime, grapefruit) to the vinegar and marinate in fridge until strong vinegar smell disappears. Then add water to dilute. We want to hear from you! What are your favorite food-saving tricks? Originally posted in the Vacaville Reporter: The United States sadly has the second highest percentage of childhood poverty amongst the top 35 industrialized countries. Nearly 15 million children in our country live in poverty, which breaks down to about one in five children not having their basic needs met. We all realize that children are the future of our society. We talk a great deal about putting money into programs that help children because we know that investing in future generations is good for all of us. The question for us today is how much is talk and how much is action? Most of you reading this probably realize that the Food Bank of Contra Costa and Solano works to provide nutritious food to low-income people in our community. However, what you may not know is that 25 percent of the people we serve are children. Children can benefit from their families participating in a variety of our programs, but we have three programs that are specifically designed to reach children. Our Food for Children program provides food to low-income children ages 4-6 who transition from receiving WIC benefits to receiving school lunch benefits. Our Farm to Kids program provides fresh produce to children in after-school programs at low-income schools. Our School Pantry Program makes shelf-stable food available to students at schools where 50 percent or more of the students are low-income. In addition to providing food to alleviate hunger, we conduct advocacy on children’s behalf to promote long-term solutions to end hunger. We communicate with our elected officials and encourage them to pass legislation such as the Child Nutrition Reauthorization bill. We believe that children nutrition programs, such as free and reduced school lunches, should be part of our society’s investment in healthy children. Beyond providing food and advocacy to local children in need, we also provide outreach to families. We attend family resource fairs and functions at community events so we can inform parents what services are available to them. One creative way we reach out directly to children is by way of a theatrical production. During the fall the Food Bank brings an assembly to schools throughout Contra Costa and Solano counties. Hungry is a 40-minute play that tells the story of Eric, a typical middle school student, whose family has suffered a loss of income. Eric’s family no longer has enough money for groceries, especially at the end of the month. Using music, humor and drama, Eric’s journey engages and inspires students as they learn about the common problem of hunger in their communities. This year’s production of Hungry is wrapping up this week. We are proud that over 7,000 students have witnessed this production this year alone. Through the performance, the students have learned how they can either help others in need or receive assistance if the need it. Hungry also drives home the point that children should not be embarrassed by not having enough food. It is not acceptable to us that anyone in our country should be hungry, but that especially applies to children. We are too great a country to accept that. To help families this holiday season, you can make a tax-deductible donation online at www.foodbankccs.org/holidays. Originally posted on the Vacaville Reporter: Since I work for the Food Bank of Contra Costa and Solano, I know I pay more attention to stories about “ugly food” than most people, but there has been a good deal of media attention recently about food that never makes it to our grocery stores. The former CEO of Trader Joe’s has established stores in low-income neighborhoods in Boston where “ugly food” is sold. Raley’s has started a program selling “Real Good Produce” that is not as pretty as the rest, but costs less. These efforts are trying to get food that would not normally come to a grocery store available to shoppers. There is a tremendous amount of food wasted in the United States every year. Estimates vary, but depending on the type of food, up to 30 percent of some crops never reach grocery stores. Consumers have come to expect flawless looking fruits and vegetables. Although using “not perfect” produce is making headlines now, it is not a new concept. Food banks in California, and throughout the nation, have spent the last several years working with the agricultural industry, so we can collectively provide nutrition to the people in need and minimize waste. Years ago, the California Association of Food Banks approached orange growers to see if there was a way we could obtain the oranges they did not sell. Oranges sometimes grow too big or develop a color that is not quite perfect. Below market-grade oranges were being sold to make orange juice, so food banks agreed to meet that cost. We also agreed to take entire trailer loads and fit our needs into the shipping logistics the fruit packers have in place. In addition, we had to demonstrate to the orange growers that we would not interfere with their markets, but would only distribute to those who could not buy oranges. We succeeded on all counts and our state association is now working with the agricultural industry to save more than 120 million pounds of food each year from waste. The Food Bank of Contra Costa and Solano distributed over ten million pounds of produce last year, providing the people we serve with apples, oranges, pears, onions, potatoes, cabbage, celery, etc. We have built distribution programs that depend on the availability of fresh produce. We provide delicious and nutritious fruits and vegetables to low-income children through our Farm 2 Kids program and to senior citizens through our Senior Food Program. Through our Community Produce Program, we distribute fresh produce every other week at more than fifty sites in Solano and Contra Costa counties. To learn more about these programs, please visit our redesigned website at www.foodbankccs.org. Given the massive amount of produce grown in the United States, we know that there will always be some waste in a system this complicated. Through community support and with the generosity of the agricultural industry, the Food Bank is able to provide “imperfect” produce to thousands of our neighbors in need and reduce the overall percentage of waste. This collective effort is having a positive impact on the health of the people we serve. We are making a difference. Originally posted on the Vacaville Reporter: Whether the information comes to you from statistical studies or just from taking a look around, it is obvious that the United States is facing an obesity epidemic. The facts are overwhelming; we have the second-highest obesity rate in the world and spend more than $190 billion a year treating obesity-related illnesses. If you think the battle over healthcare is a major issue today, imagine what is going to happen as obesity and other diet-related illnesses increase the need for high-cost medical services. As with so many of the issues we face as a society, the answer is fairly straightforward, but is difficult to implement because it requires us to think and plan long term. It will require us to change patterns that have developed over decades. For more than a generation, our diet has deteriorated as we’ve replaced fresh food with prepared ready-to-serve meals and fast food.We have saved time and created convenience, but our diets are now filled with processed and sugar-laden foods. The associated health issues we see today are taking a toll on our society. We have saved time and created convenience, but our diets are now filled with processed and sugar-laden foods. The associated health issues we see today are taking a toll on our society. This situation will not turn around overnight, but the conversation around the importance of improving our diets has at least begun and some progress has been made in our children’s school cafeterias. The nutrition standards of school meals were updated in 2012 under the Healthy, Hunger-Free Kid Act. These improved standards require more fruits, vegetables, and whole-grains and less sodium, fat and sugar in school lunches. A survey done by the Pew Charitable Trust and the Robert Wood Johnson Foundation found that 72 percent of parents support strong nutritional standards for school meals. Another study published in Childhood Obesity, found that 70 percent of middle school students and 63 percent of high school students like the more nutritious school meals. Kids are being exposed to healthier food in their school lunches and they are gaining first-hand knowledge that healthy food can taste good. Most of the children we serve at the Food Bank of Contra Costa and Solano receive free or reduced costs lunches; making the meals they receive at school an important part of their diet. By providing students healthier food on a regular basis, they are learning that fruits, vegetables and whole grains are an important part of a wholesome diet. Furthermore, they are developing patterns that will fight obesity and other health-related illnesses. We are doing the right thing when we feed our children well; we are setting them up to be healthy and successful. A healthy school lunch is one of the best investments we make in the future of our society. Originally posted in The Vacaville Reporter: Over the last two years, the Food Bank of Contra Costa and Solano has seen a 26% increase in the number of people we serve, due to people struggling from the recession and an increase in programs available through the Food Bank. The significant increase of produce available to the Food Bank has been a dramatic change in the type and amount of food we distribute allowing people to more easily receive nutritious produce in the areas where they live. At the same time, the increases we have seen in donations of perishable food at the retail level have grown significantly to meet the need as well. The Food Bank has transformed over recent years from providing emergency help at the end of the month when food and funds have run out, to becoming a support system to help families make ends meet. Improving the nutritional value of food available to people through the Food Bank and our partner agencies has and will continue to help meet this need. Last year, 50% of what we distributed was fresh produce which is often too expensive for people facing economic challenges. The California Association of Food Banks understood how marketing orders keep cosmetically imperfect produce from being sold; they also found that there was a secondary market for that produce. Growers got paid a small amount for unmarketable produce when it was sold for animal feed or juice. By appealing to growers to help us feed those in need, we got access to oranges at the same price the juice people were paying. We showed the growers that we did not interfere with their markets and we made a difference in the lives of thousands of people in need. The persuasive work of food banks convinced the apple growers, pear growers, and potato and onion growers that they should donate too. We will continue to work on increasing the amount of fresh produce available to us because it is now more than half the food we give out. The work of Feeding America, our national network, has increased both the quality and amount of food available to us from retail stores. The grocery industry recently made a major operational change, with Walmart, Target, Sam’s Club and Save Mart stores agreeing to donate food to Feeding America food banks. The grocery industry is justly concerned about the liability they would face if food donations they made were improperly handled, so Feeding America worked for years with the grocery industry to develop standards Feeding America food banks meet for safe food handling. All food banks and the agencies they serve undergo Serve Safe food safety training. In addition to this training, we provide the agencies with which we partner freezer blankets and scales so they can properly record the donations they pick up from local stores. The stores that donate to us are able to be greener by eliminating the waste they would have produced. When meat is coming to its “sell by” date, the store freezes the meat until it is picked up by one of the properly trained agencies that work with our Feeding America food bank. We have developed a system that has member agencies serving stores as often as they have food donations available. In this way, local stores are following the lead their national headquarters has developed with Feeding America. On a local level we get the high-quality food we so desperately need while our local grocery stores are eliminating waste while they work to help feed their neighbors in need. Thanks to this significant growth in donations of fresh produce and retail donations of perishable food items we are able to provide and excellent source of nutrition to the increased number of people we serve. Originally posted in The Vacaville Reporter: As often sited, public speaking is the most common fear. People have anxiety attacks when they think of making a speech to an audience, large or small. When I became Executive Director of the Food Bank of Contra Costa and Solano, I had to learn to speak before groups to help us build the community of support that is necessary to our work. The fact I have become as comfortable as I am when I speak to people about the Food Bank’s work is because I believe so strongly in what we do. When I try to persuade people to join us in our work I am not selling them a vision, I am offering them an opportunity to make a difference. I believe that people understand there is no reason in a society as rich as ours that anyone should be hungry. With so much evidence of the need for hunger relief and stories we hear in the lines of our distributions, we see the problem often. We also know there is a solution. It is my job to share the stories of our clients and explain to as many people as possible how they can help. I speak to faith communities, service clubs, schools, and businesses. I have talked to people in office suites and in factories. In my experience, if people understand that they can help by volunteering and giving food or money, they are happy to do so. Our task at the Food Bank is to reach out to those who can help so they understand how that can make a difference. One of the ways we reached out to our supporters was organizing a wine and food event at GV Cellars in Fairfield on August 3. G V Cellars provided their space and provided a great deal on wine because they believe in our mission. MagPies Catering also went above and beyond with the delicious food they provided at a reduced cost. Westbound 80 performed classic rock music, and also donated to the cause. Not only did this event help us generate revenue to support our work, but, as importantly, it helped us connect with the people who make our work possible. The Community Produce Program truck was set up at the event to show how much fresh produce their donation can provide. A display showing the huge amount of healthy food we are able to purchase with $100 surprised and delighted guest. When people understand how the Food Bank works, and understand how effective we are with their donations, I believe they will continue to help us feed those in need in our community. It is my job to help people understand, so please, invite me to your next club meeting, service group or class. Either through Facebook, Twitter, or face-to-face, we will continue to tell our story so people understand how they can help. The Food Bank of Contra Costa and Solano – the county’s trailblazer in hunger relief – is excited to welcome Assemblymember Mariko Yamada to Community Produce Program in Dixon on Wednesday, July 16. Assemblymember Yamada will be volunteering at the site, helping to ensure that each person in need receives fresh fruits and vegetables to take home. “California is on the mend, but far too many people are still struggling to make ends meet,” said Assemblymember Mariko Yamada, Chair of the Assembly Aging and Long Term Care Committee. “Through no fault of their own, working families, students and seniors face skyrocketing food prices because of the drought and the price tag for staying cool in scorching temperatures. Food insecurity is a daily reality for millions of Californians. Children, the elderly, the disabled, and students are the faces of hunger amidst plenty. The drought and summer bring added challenges to ensuring that our community’s nutritional needs are met. The Food Bank of Contra Costa and Solano works to end hunger and increase access to nutritious food for low-income individuals and families. The Community Produce Program is just one of the ways that the Food Bank distributes food directly to people in need. Refrigerated trucks have been customized for the exclusive purpose of distributing fresh produce to communities in need. Clients will be able to pick-up an average of 20 pounds of produce, twice per month. In addition to the strong leadership Assemblymember Yamada provides in the legislature, we are grateful for the hands-on help she is bringing to the people we serve,” said Larry Sly, Executive Director of the Food Bank. Help the Hunger Awareness efforts and learn how to apply for food assistance by Clicking Here. Join the Yamada Volunteer Crew and post your hard work on social media with the #HashTags: #YamadaVolunteer #Yamada4HungerAction #[YourCounty]Volunteer on your social media accounts. Originally posted in The Vacaville Reporter: The drought we are currently experiencing raises serious questions about how we use a finite resource. The Mediterranean climate we enjoy means that we have long summers where no rain falls. In normal years, the snow that falls in the Sierra Nevada mountains has been our reservoir and provides the water we need in the summer. Much of the water is needed for agriculture because California has some of the most productive soil in the world. Our water system works well as long as snow falls in the mountains, but when a drought takes place, competition begins for the limited water available. Residential consumers are urged to limit the amount of water they use. We may have green lawns and swimming pools, but many homes have drip irrigation, low-water landscaping, low-flow toilets and other technology to make effective use of the water they use. There are debates about how you compute the numbers, but urban water use is less than 20% of the total consumed in California. One third of the water used in the state goes for environmental purposes; making sure rivers have adequate fresh water to support a healthy environment. More than half the water the state consumes is used for agricultural purposes. Residential consumers often wish that water could be saved in the agricultural and environmental areas. Some people argue that using “environmental” water to preserve fish should take second place to water for agriculture. The looming battle over the bypass tunnels proposed to move fresh water from rivers above the San Joaquin/Sacramento delta raises concerns about the impact that action would have on the environment of our local area. If we decide that environmental and urban uses are most important, what does that mean for agriculture? Agriculture is a major part of California’s economy. California farms and ranches generate over $42 billion worth of revenue. Of that revenue, over $18 billion is food we export to other countries. Over 11% of the food produced in the United States comes from California, and over half the fruits, nuts and vegetables consumed in the United States are grown in California. Our climate and our water make a major contribution to California’s economy and the nation’s food supply. The work of the Food Bank of Contra Costa and Solano is possible to a certain extent because we are located in California. Because food grown in California sometimes does not meet marketing standards, the Food Bank can reclaim that food, allowing us to provide fresh produce to people in need in our community. Because of the drought, some of the crops we received in past years are not available to us currently, plus everything we receive costs more. Fresh fruits and vegetable prices will go up an estimated 6% in the coming months according to the federal government. In order to get the food we need, we depend on agriculture, and agriculture depends on water. Difficult decisions need to be made both by government and at home as we decide how we can best use the water on which we all depend, so people of all income levels have access to fresh fruits and vegetables. The feeling is this is ok because CalFresh recipients are receiving benefits we as tax payers help provide. I think there is an assumption that people who are poor are somehow less than those of us who are not, so they need to meet the standards we set for their behavior. We already say CalFresh benefits can only be used to purchase food, not soap or toilet paper (two fairly essential parts of a healthy life I think) so taking it much further becomes an issue of judgment. Part of the reason CalFresh benefits were changed from Food Stamp coupons to an ATM-like card was to diminish the stigma recipients felt as they went through the grocery line. We have all heard the theoretical story from someone who saw a Food Stamp recipient in a grocery line buying food “I could never afford” with their CalFresh benefits. Part of this judgment may not even be based on reality. A CalFresh benefit of just $100 won’t go very far to buy groceries for the month. Careful planning becomes essential and many recipients are actually making do with affordable basics like dry beans, frozen vegetables and pasta. Because people are poor, we somehow feel it is their fault and we somehow assume it is because of the bad decisions they make. In reality, we hear stories every day of losing work to disability, the economy, or the added financial burden of taking care of an aging parent. I encourage you to try it for yourself. Take the Hunger Challenge to live on just $4.50 of groceries a day to see how challenging it is to nourish yourself. Find the guidelines at www.foodbankccs.org/hungerchallenge and let me know how it goes. I have a support system that saves me if I fall on hard luck, but for some the Food Bank and CalFresh may be the safety net keeping their family from going hungry. We can, and do inform the public about healthy eating and offer nutritious choices and education in our Food Bank programs, but believe that our clients should be treated with the dignity to make their own decisions. Originally posted in the Vacaville Reporter: Mathmatica Policy Research did a study that led them to conclude “simply stated, SNAP works”. (The SNAP which stands for Supplemental Nutrition Assistance Program was formerly known as the food stamp program and is known as CalFresh in California). Mathmatica’s research demonstrated that because they participated in the program, children had significant improvements in their consistent access to food, also known as their “food security”. The Mathmatica food security study surveyed 3000 families and compared the status of families newly-enrolled in the program with those who had been in the program for six or seven months. In the initial part of the study, 37% of newly-enrolled families were food insecure, while those who had been on the program six months or more were at 27%. When they checked the newly-enrolled group after six months they had seen their food insecurity decline from 37% to 25%. This type of research shows the wisdom of feeding those in need in our community. If an individual is food insecure they cannot find enough food or purchase enough food for themselves. In a society as rich as ours, with huge agricultural surpluses, there is no reason an individual should be food insecure. More importantly, there is no reason a child should be in that position. Increases in SNAP/CalFresh that were part of the American Reinvestment and Recovery Act (ARRA) were eliminated in November of 2013. After that, Congress cut $8 billion in funding for the program over the next ten years. Because of these actions, average benefits for recipients will drop below $130 a month. I know there are some people who can make that work, but I also know from my attempts to live on the average CalFresh budget for a week, that the benefits are not enough. These budget cuts will have a negative impact on people’s ability to feed their children. My father grew up during the Great Depression and he told me stories of receiving blocks of cheese and bags of sugar from the government. I don’t think he was ever hungry, but he lived in a house where concern about the next meal was a part of their life. He saved every scrap of leftovers until the day he died and his choices in the grocery store always were always based on price. I think we are in danger that the budget decisions that are being made are creating a generation that will be as food insecure as those who lived through the Great Depression. It’s frustrating that we are cutting a program that provides hungry people the ability to get food. People are on the program for a short period of time (average of nine months) and research shows that the effects are positive, whether you measure improved nutrition or food security. By giving people SNAP/CalFresh benefits, we are making sure that our children receive the food they need. We are making an investment in the future of our society when we help hungry families. Originally posted in the Vacaville Reporter: Change is never easy. We all know people who tout their flexibility and their openness to change, but lock themselves up when change begins. (Other people of course, not us.) At the Food Bank of Contra Costa and Solano it is interesting to watch this take place around a subject everyone knows needs to be addressed, improving the nutrition of our children. Obesity has risen dramatically among younger people (and adults too) over the past twenty years meaning that diabetes and other diseases are becoming a major health problem for our society. The astronomical costs of treating those diseases, as well as the other problems we face as an obese society can be prevented by changing what we eat. Most of us recognize we eat too many fats, too much sugar, too many empty calories. In principle we all understand that we should eat more fresh fruit and vegetables and more whole grains. If we are going to take steps to implement these changes, one of the most effective ways is to start with our children through the school lunch program. By providing students with a healthy lunch, we can give them good food to eat once a day as well as helping to educate them about how good food tastes. Seems simple, right? In fact, changing school lunches has become a major political issue. The School Nutrition Association, a lobbying group that focuses on school lunches has switched its position from supporting the changes recently implemented in nutrition standards to now asking for relief from those standards. There are anecdotes about the disruption the new standards have caused that raise legitimate concerns. Stories are told of schools in the Southwest having whole grain tortillas thrown away because they are not culturally acceptable. Applesauce is thrown away as are fresh fruit and vegetables. And of course, funding is not adequate for these districts to provide increasingly expensive healthy food. On the other side, school districts in rural Georgia share stories of how they were able to move from fried chicken (a Southern staple) to herb-baked chicken that kids love. Locally grown grits are one of the most popular items for their school breakfast program. Here in our community, some school districts are purchasing fresh produce from local farms, providing healthy locally-grown food to their students. But beyond these operational issues, on the political side, a group named the Coalition for Sustainable School Meals Programs has pushed Congress to designate pizza with tomato sauce as a vegetable. The goal of providing healthy food to our children gets complicated because providing school lunches is a multi-billion dollar program. While a few people may defend the status quo of the school lunch program, most agree that change is necessary for the good of our children. For the sake of our health, we need to see a change in our individual diets, and that will only come about through education. We need to begin with our children.